Unbeknownst to me I happened upon a little wild weed that apparently British chefs are fighting over. I saw it at the organic supermarket the other day, labelled Agretti, sitting between the leeks and the lettuce in bunches looking like thick long grass. I had heard of this weed from my mother in law, but had never seen it at my organic market before so of course I had to try it now that they had it. I picked up two bunches at 2 Euro 50 a pop. At the cash register on the way out I asked the clerk how I could prepare it and he said to just sautee it with olive oil, salt and chili flakes. My curiosity peaked and I got home to reference Google, the true school of culinary arts, and learned that it is most commonly sauteed and served with olive oil and lemon or used in frittata and quiche. I also found out that British chefs are fighting over a short supply of it, that it was once burned and turned into soda ash for use in glass and soap making in Italy and Spain and that while it is native to the Mediterranean basin, it can also be grown in many other climates like Japan, and has been found growing on the Pacific coast of North America and is making its way around the California farmers markets. Agretti (Italian for “little sour ones”), also known as barba di frate (“monk’s beard”) is a little known edible weed that is growing in popularity. In Latin it is known as Salsola Soda and in English it goes by more names than an International spy; Opposite Leaf Russian Thistle, Opposite Leaf Saltwort or the Barilla plant. In Japan it is apparently referred to as land seaweed. It looks a lot like long thick green grass and has a flavour that some say is reminiscent of spinach, but I find it a lot more fresh and tart with salty undertones. Unlike the Italian name suggests though, I wouldn’t describe it as sour. As it turns out, it makes a killer pasta condiment. I sauteed the agretti in the smallest amount of olive oil with garlic and sundried tomatoes, cooked it with a few drops of pasta water until it had wilted but still had bite, seasoned it with chili flakes and black pepper, then tossed it with quinoa and brown rice spaghetti and the juice of half a lemon. Spring freshness in a bowl. If you can’t find it where you are go ahead and try the recipe with baby spinach, while I’m certain it would be delicious, keep in mind that it won’t be quite the same as using agretti. If you’re into growing things and really want to grow your own, it seems that it can be done, check out this link from Jamie Oliver’s gardener. Agretti is apparently from the same family as spinach and beets and is loaded with nutrients. It has a high water and dietary fiber content and is rich in vitamin A, calcium and phosphorous and an excellent source of chlorophyl. 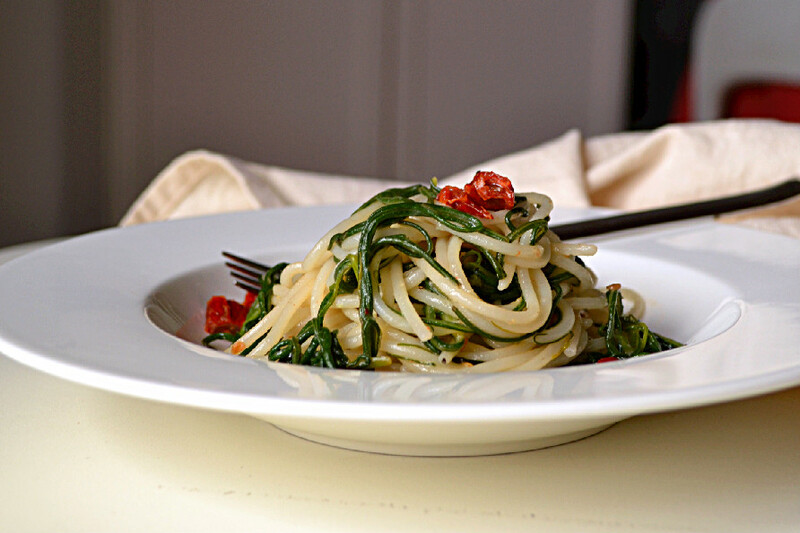 Agretti is a good source of vitamin C and complex B vitamins, iron, potassium and magnesium. It is also low in calories, with only 17 calories per 100 grams and even lower in fat content. I had trouble finding nutrition information in my nutrition books and on my typical reference web sites so I got this nutrition information from the Italian web site benessere.com. Clean agretti by cutting off the roots (purple and white parts), and using only the bright green parts. Soak and rinse thoroughly to remove all traces of dirt, strain and set aside to dry. Meanwhile, bring a large pot of water to boil, add coarse sea salt and cook pasta according to package directions for al dente. While pasta is cooking, sautee crushed garlic and sundried tomato pieces until garlic is slightly browned. Use extra virgin olive oil for extra flavour or in water for oil free (garlic won’t brown in this case). Add rinsed agretti and a couple of drops of the pasta cooking water and sautee until wilted but still have some bite. about 7-10 minutes. Season with fresh ground black pepper and chili flakes to taste. Strain cooked pasta, reserving the cooking water. 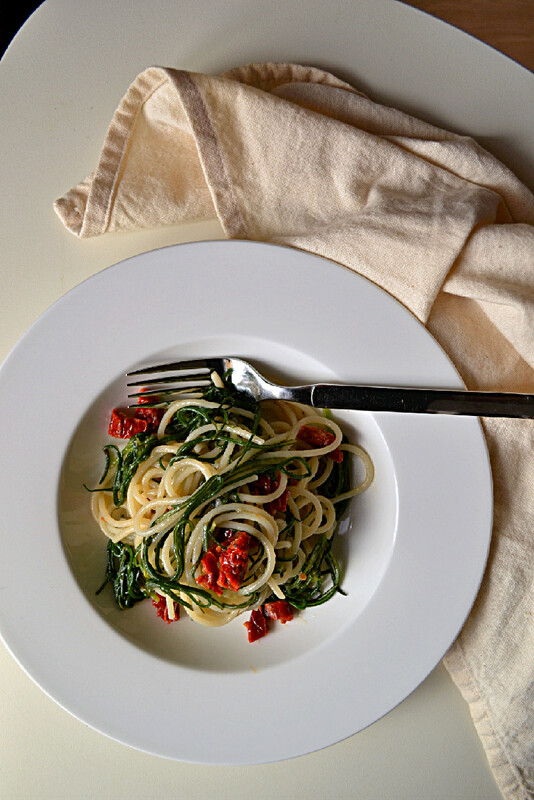 Toss spaghetti with the sauteed agretti mixture over low heat, using some reserved pasta cooking water as needed to amalgamate everything. Add lemon juice to taste, and a drizzle of extra virgin olive oil if desired, toss some more and serve immediately. 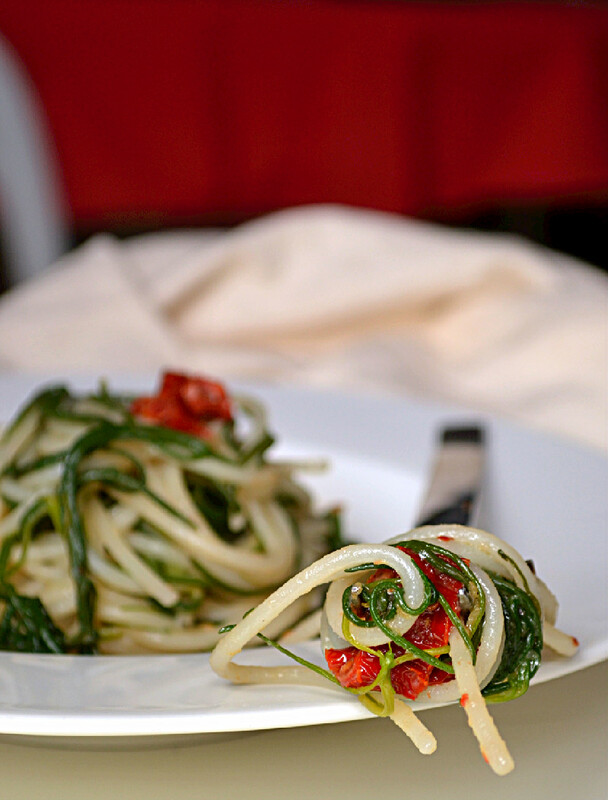 If you would prefer to avoid pasta, the agretti with sundried tomatoes and garlic can be served as side dish to any whole grain or meal of your choice. I’m sure that’s to be expected, but never heard of agretti before — love that you’re introducing me to new foods 🙂 If I had to guess, I would have thought you made pasta with chives. I’m so curious now though — will have to try it if I ever come across some. Yes, Audrey, they do look like chives don’t they?! Hadn’t even thought of that. Definitely worth a try if you do come across some, although I’ve never seen it in Canada.